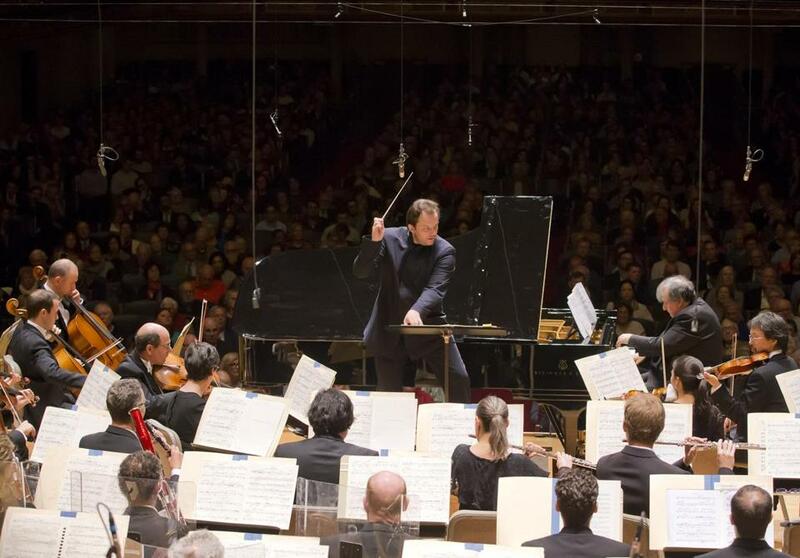 Andris Nelsons leading the BSO at Symphony Hall on Thursday. Thursday’s Boston Symphony Orchestra concert began with two notes: G-flat and F, played by pianist Yefim Bronfman at the opening of “Trauermarsch” (“Funeral March”), a 2014 piano concerto by German composer Jörg Widmann. Those notes are a half-step apart, as close as two pitches can get in traditional Western music, and that interval reappeared throughout the piece as a guiding thread. About an hour later, those same two notes were heard near the beginning of another funeral march, this one the second movement of Brahms’s “German Requiem.” Now they were the start of a heavy, sighing melody that evoked a weary trek through life. That link between the two pieces on the Andris Nelsons-led program was a subtle one, and likely went unnoticed by many listeners at Symphony Hall. But it spoke to how intelligently the program had been crafted. There were connections at levels both general (two funerary works) and ultra-specific (those half-step motifs). Perhaps most important, the concert brought together two composers whose works stage a complex yet fruitful dialogue between past and present. Take “Trauermarsch,” the first piece by Widmann to be played by the BSO. It is unmistakably music of our own time: its dissonance and wildly varied timbres — a gong submerged in water, a death rattle in the strings — tell you as much. Yet echoes of late Romanticism abound, and the influence of Mahler and Berg is clear in its instrumental coloring and winding melodies. “Trauermarsch” is actually several marches forged into an unbroken 25-minute stretch. It begins as something haunted and lugubrious and around the middle reaches a brief, galloping frenzy. There is a chaotic encounter between piano and orchestra that it is difficult to imagine someone actually marching to. The collapse of the music’s pent-up energy leaves a few scattered echoes of the original march rhythm at the end. Bronfman, for whom the piece was written, was outstanding, as compelling in the quieter, Nocturne-like passages as in those demanding the utmost physical exertion to be heard above the orchestral rancor. Nelsons’s direction not only was alert to moment-to-moment details but urged this highly sectionalized piece onward toward its bleak finish. Any performance of this piece stands or falls in large part on the strength of the chorus. The Tanglewood Festival Chorus, prepared by guest conductor Lidiya Yankovskaya, generated plenty of power but didn’t exhibit the kind of precision and command evident in previous performances. There were messy entrances, unsteady pitch, and blurry diction. The dynamics were mostly limited to loud and soft, without much middle ground, and balances between chorus and orchestra were sometimes askew. Yet there was also an abundance of affecting moments, especially those in which Nelsons’s mostly slow tempos allowed the music’s autumnal glow to emerge. The lower strings and brass were superb throughout. Soprano Camilla Tilling had a shaky beginning to her fifth movement solo; elsewhere she sang accurately but without the delicacy this music demands. Much better was baritone Thomas Hampson — a model of dignity, vocal presence, and deep investment in the texts that Brahms so lovingly chose and set.